Separation Machinery Market size will surpass USD 100 billion by 2024; according to a new research report by Global Market Insights, Inc. Global water demand shall have a strong rise in the coming decades in response to the necessities of a rising global populace. The water demand of the agricultural division is currently responsible for about 70% of water abstractions across the globe, wherein large upsurges have been predicted for industrial usage and the energy production in the near future. Separation machinery market will be propelled by the growing demand for the wastewater treatment in the coming years. As of 2017, the high-income countries treat approximately 70% of the wastewater they generate, whereas this ratio falls to 28% in lower middle-income and to 38% in the upper middle-income countries. Increased demand for cleanable and reusable separation technologies in response to recycle and reuse the resources will drive the demand for separation equipment by 2014. As per the FAO estimates, manufacturing of food products consumes on average about 5 m³ of water per person, per day in Europe, whereas as much as 1.3 billion tons of food is wasted annually-which indicates around 250 km³ of water is being lost every year across the globe. An increased in manufacturing efficiency for foods & beverages, industrial products, infrastructure and transportation will essentially suffice an increased need for separation technologies, thereby providing brighter scope for separation equipment over the forecast timeframe. Industrial centrifuges held the highest share in global separation equipment market in 2017 with a share exceeding 30%. Membrane separators are estimated to grow with 4.2% CAGR by 2024. With the stringent guidelines, depleting natural resources and environmental concerns membrane separators are forecast to have significant growth by 2024. Water & wastewater segment contributed the highest share exceeding 20% in separation equipment market in 2017. With a better utilization of the plant space in urban areas, industry participants are likely to employ less polluting and self-sustained closed-cycle water technologies in future years, wherein the usage of separation equipment will be inevitable. 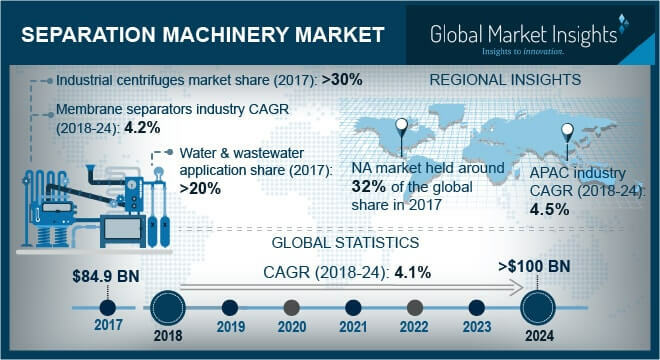 Increasing concerns of governments regarding disposal of water will also drive the demand for separation machinery for water & wastewater applications. Life sciences area of applications which consists of various end-users such as: pharmaceuticals, food & beverage, agriculture, etc., is likely to observe the fastest growth by 2024. Global separation equipment market was led by North America with a share exceeding 30% in 2017. The U.S. Environmental Protection Agency has been supportive of making the wastewater effluents cleaner, particularly in terms of nutrients. Such regulatory framework will strengthen the demand for separation machinery by a range of end-users in future years, thereby supporting the market size growth by 2024. Key players in separation equipment market have been engaged in research and development activities for providing cost-effective and advanced products for the end-users. The combination of competence, experience and innovative spirit ensures the proven and long-term benefits. Leading players in separation machinery industry include: Ferrum AG, Rotex, Schlumberger Limited., Hiller Separation & Process, Parkson Corporation, Forsberg's, Inc. etc.